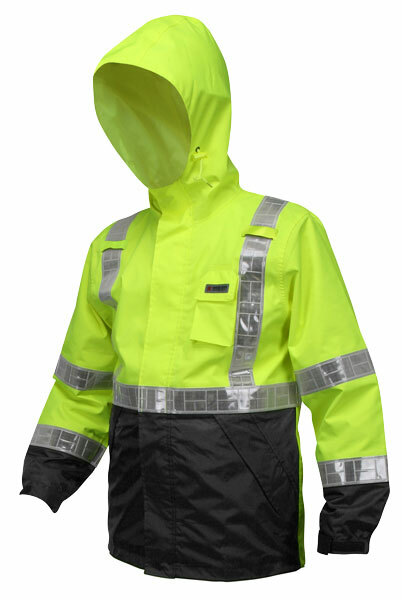 For those applications where being seen is of the utmost importance, MCR Safety's Luminator™ Series offers you a variety of high visibility garments made in different colors and different options of reflective material. The 598SJH is a fluorescent lime/black jacket with attached hood. The polyester/polyurethane material has a light polyester liner that makes it comfortable and easy to put on and remove. This material is breathable and waterproof, making this premium offering cooler and more comfortable than comperable non- breathable options. Features include a zipper front with hook & loop storm flap, attached drawstring hood, covered zipper pockets, and white relective striping. Other features inlcude hybrid elastic/hook & loop wrist closures, drawstring waist, and shaded black material in high wear areas. Meets or exceeds ANSI/ISEA 107- 2015 Class 3, Type R high visibility standards.